A lesser known fact is the Ganga Dashahara, the birthday of the holy river Gaṅgā गंगा (gaṅgA, erroneously called Ganges in English) in the month of Jyeshtha (June). There are many stories on her. She descends from heaven to earth upon the penances of king Bhagīratha भगीरथ and gets the name Bhāgīrathī भागीरथी . Her force could not be borne by the earth, so Shiva शिव catches her fall in his matted locks making her controlled river. 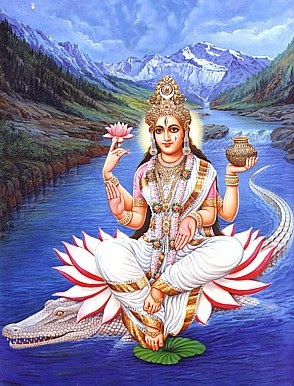 Even the actual river is called Alakanandā अलकनन्दा when she starts, and later on is called Gaṅgā गंगा . 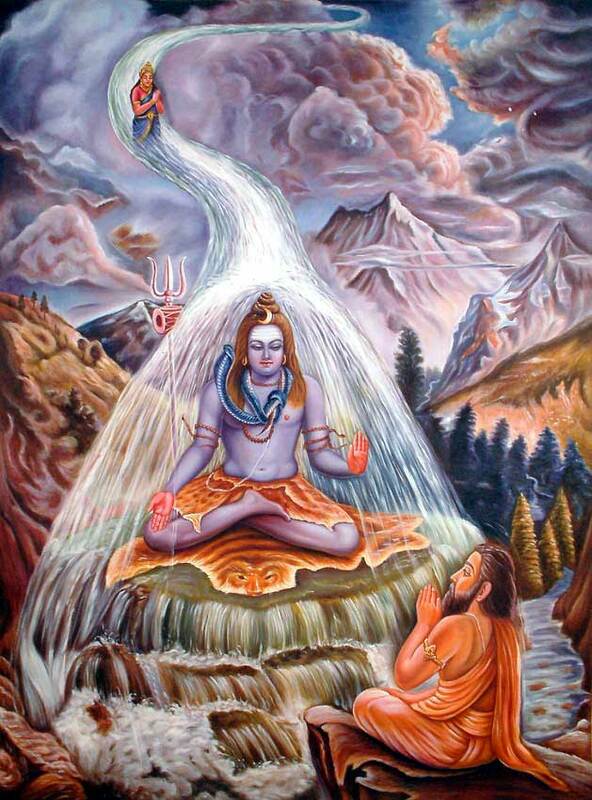 Another story goes that when Shiva शिव sang, Viṣhṇu विष्णु was so moved, he started to melt. Brahmā ब्रह्मा the creator collected the melting Viṣhṇu विष्णु and put in his kamanḍala कमण्डल (water carrying hand pot), and from that he made Gaṅgā गंगा , and hence she is also called Viṣhṇu-padī विष्णुपदी- coming from Viṣhṇu's feet. After her descent, she followed Bhagīratha भगीरथ , but strayed in the āshram आश्रम of ṛiṣhi Jahnu ऋषि जह्नु , upsetting his place. The upset ṛiṣhi ऋषि drank her up. Upon Bhagīratha's request he slit his thigh and let her out. Hence her name Jāhnvī जाह्नवी . She married the Mahābhārata महाभारत king Shāntanu शान्तनु , when she was forced to be earth. There she gives him a son Devavrata देवव्रत, later to be known as Bhīṣhma भीष्म - the ne who made a severe vow (of never marrying or having a progeny). She is held sacred and its water really have healing properties. (In modern days, pollution is a big problem). 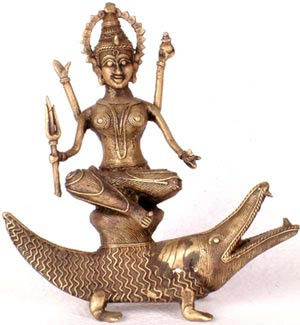 Her vehicle is the makara - a hybrid of gharial (Indian crocodile), fish and other creatures. - are remembered as the three sins done by the body. are surely the four types of sins of the speech. - are remembered as three sins of the mind. 4. O Ganga, you take away these ten sins of mine. remembered as dashaharā (remover of ten [sins]). 1. Taking what is not given - Raavana, after his almost invincible boon of no defeat, took not just what was given to him, but took what he wanted by force. 2. Violence - He fought, killed many, and even went around the three worlds asking for a good fight, defeating everyone. The Vindhya mountain declined his offer for a fight and said King Vali would be a good match. Violence was in his genes. He terrified the three worlds, and hence he got his name Raavana - the one who makes others cry. 3. Taking to others' wife - He kidnapped Sita, who was married to Lord Raama. That was his biggest mistake. He never accepted that as his fault, and finally paid by his life. 4. Harshness of words - Ravana's words were always harsh. He talks harshly to anyone who advices him. He talks harsh to Vibhishana, to Sita, to everyone when he goes around picking fight. His very nature is harsh. 5. Lies - He lies multiple times. When he disguises as a sage and asks for alms from Sita and kidnaps her. When he makes a false head of Rama to convince Sita of Raama's death. 6. Slander - He talks ill of Raama multiple times with impunity. Raama as a human, was the only way he could be killed. 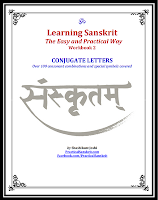 In the boon from Brahmaa, he asks protection from Deva, Raakshasa, Gandharva, Kinnara, Naaga etc. and categorically mocks human and animals as being weak as a straw. Ridiculing the greatest of God's creation is what he pays for at the end. 7. Incoherent, incessant blabbering - Speech is precious, prANa breath! He talks on and on about himself, boasting his powers, making no sense at times. 8. Thinking of others' wealth - He not only thinks, but loots everyone in three worlds. 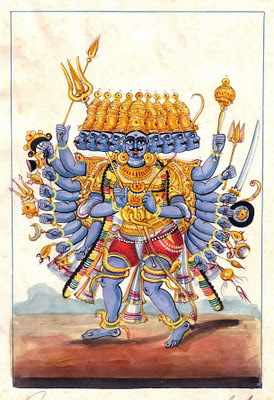 He takes the city of Golden Lanka from his cousin Kubera, and wealth of all the kings he defeats. 9. Thinking ill for others - He never wishes good for anyone. He thinks,plans and acts hurtful for others in his pride of power. 10. Liking for rumors, myths, fantasy - He misuses his magical powers to create illusion, tries to convince Sita of Raama's death, and has a false fantastic pride. 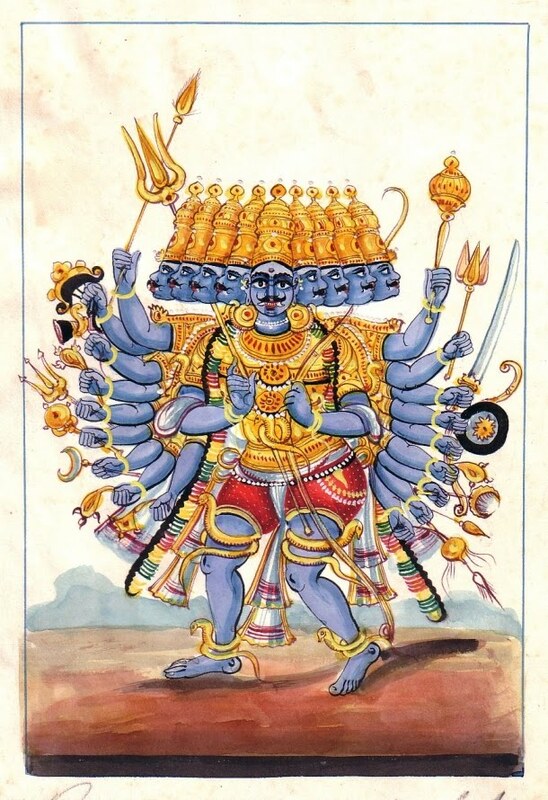 On this day when Raama kills a ten headed Raavana, the Devi kills the ten sins metaphorically. And Ganga washes away all sins - if one approaches sincerely. The change of heart is the only way to wash the sins. e.g. kutaH = from where? upasevA = enjoying, having [immoral] affair. 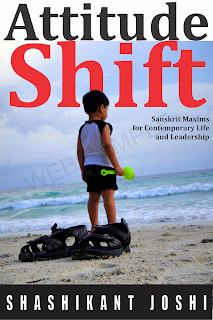 smRitam = is remembered, is called, is said, is known. of the sage jahnu. jahnu drank her up and let her out of a cut through his thigh. Got to know Ravana better with this post :-) Hail Mother Ganga and may she be restored to her original purity!